It's Time to Stem the Tide! Otherwise this hatred ’of the other’ will destroy the general trust which is necessary for societies to function more or less harmoniously. Constructive criticism is a matter of course, but stereotypes are dangerous.5 Speak up, but speak with respect! We again condemn all forms extremism from any side! We've done this already here: ⊏1, ⊏2, ⊏3, ⊏4, ⊏5, ⊏6, ⊏7 och ⊏8. 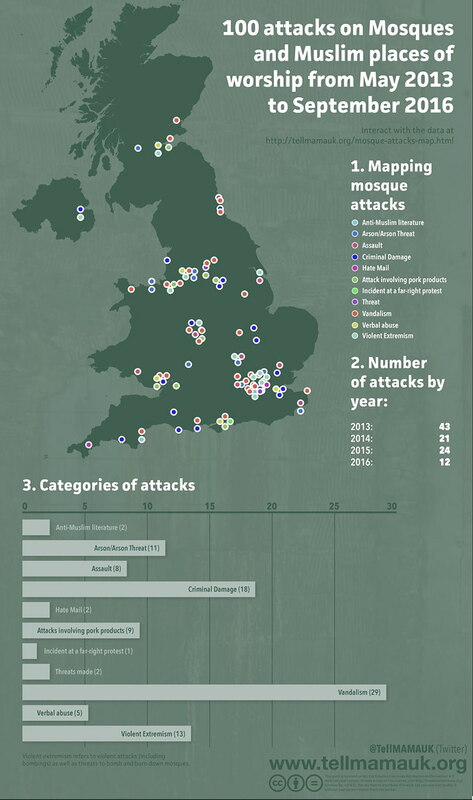 Vigilante and extremist attacks on Muslims are hollowing out the fabric of our societies. First the Muslims - then the rest. It is a proven way to divide the people - and then to rule over them by authoritarianism. NB: All illegal acts have to be persecuted and punished, no matter who is the perpetrator! With the bad image for Islam that the extremists of ISIS a.o.1 have evoked and the damage which they have done - mostly to Muslims - we understand that there are today those who have lost all hope in Islam and even in God - however this must not become an excuse to harbour bad feelings against Muslims and other people of faith. * i.e. same day as the massacre! Query: Don’t you mean defeating radical Islam? Ayaan Hirsi Ali: No. Islam, period. Query: We have to crush the world’s 1.5 billion Muslims under our boot? Ayaan Hirsi Ali: I think that we are at war with Islam. And there’s no middle ground in wars. Islam can be defeated in many ways. Donald Trump: "Islam hates us." Sam Harris: "It is time we admitted that we are not at war with 'terrorism.' We are at war with Islam." - Regarding this horrible terror attack see [below]. Islamophobes want you to think their words and actions had no part in Friday’s atrocities. (Noah Kulwin @nkulw) wrote about why they must not be believed. 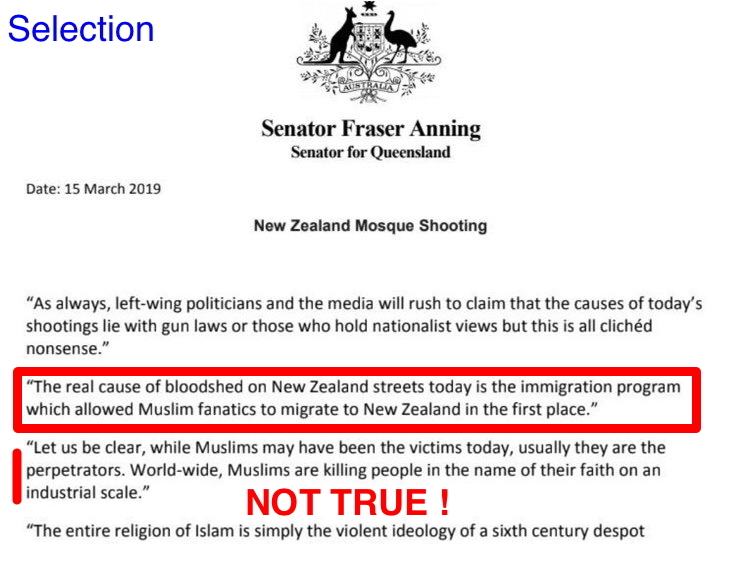 ”While the broader right-wing movement spent Friday attempting to condemn the loss of life while distancing itself from any ideological basis for the attacks, which were carried out by at least one Australian white supremacist, their more highbrow counterparts have an even trickier task. This chattering class of chickenhawks has never been meaningfully held to account for mainstreaming anti-Islamic hatred in the media and helping to codify it in policy over many years. Like so many times before, they’ve diverted attention from their Islamophobia with spurious accusations of antisemitism on the left. It’s an audacious heel turn, and it usually works, until a great horror like Christchurch reveals where the balance of power really lies. 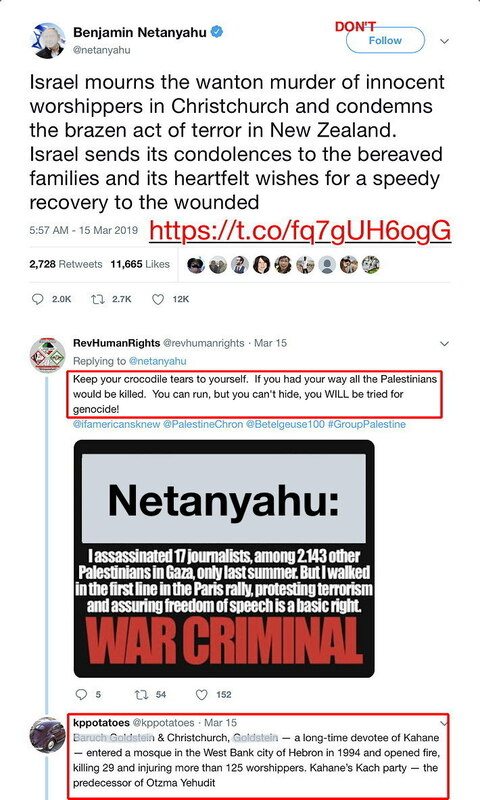 All four of them, and the wider cohort of right-leaning pro-Israel pundits they represent, have been monomaniacally focused on demonizing one of only two Muslim women in Congress, while almost entirely ignoring the white supremacist threat faced by Jews and Muslims alike, or at most, gesturing at it for the sake of evenhandedness. Trump: "I have the tough people"
"Trump is a symbol of renewed white identity & common purpose." Also this thread on the Terror from the Extreme Right. 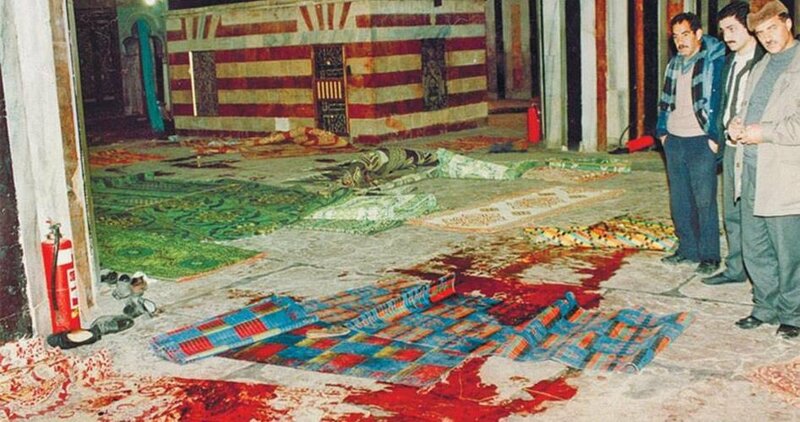 Palestinians survey bloodstained rugs at Ibrahimi mosque after 1994 massacre. Regarding the almost completely uncritical interview @BBCNewsnight conducted with Benjamin Jones the UK leader of the far right identitarian group ’Generation Identiy’ (GI) tonight. It’s a disgrace & an embarrassment to UK journalism and the BBC. It’s also a big propaganda win for GI. This is not a legitimate debate in a democracy. There should be no platform for Generation Identity on BBC. YouTube on Tuesday placed restrictions on far-right anti-Muslim British activist Tommy Robinson's account, but stopped short of banning him from the platform. Robinson's YouTube videos will now be prefaced with a warning saying his content may not be appropriate for all audiences. He will no longer be allowed to livestream and his videos will no longer have view counts, likes or comments. Strange, isn't it, that when an Islamic terror attack happens, somehow all Muslims are seen as terror suspects. But when a far right terror attack happens, it's a nice guy gone mad and no one "tars" all the far right with the same brush. [Standard media does so:] Humanise the attackers, tell us about their issues at school and weight problems whilst failing to mention their lengthy manifesto, it’s content. Turn the tables and if it’s a Muslim nothing beyond the attack is examined apart from his faith and perhaps what mosque he attends. Why are @SkyNews repeatedly showing the #NZ murderer and his neo nazi white supremacist hand movements. In fact they focus in on it! Isn't this exactly the media coverage he craves! Disgraceful broadcasting! Show some respect FFS! Using Sky News to communicate to like 'minded'! Everyone should stop buying this man's products! How 21st tabloid broadcast media works. 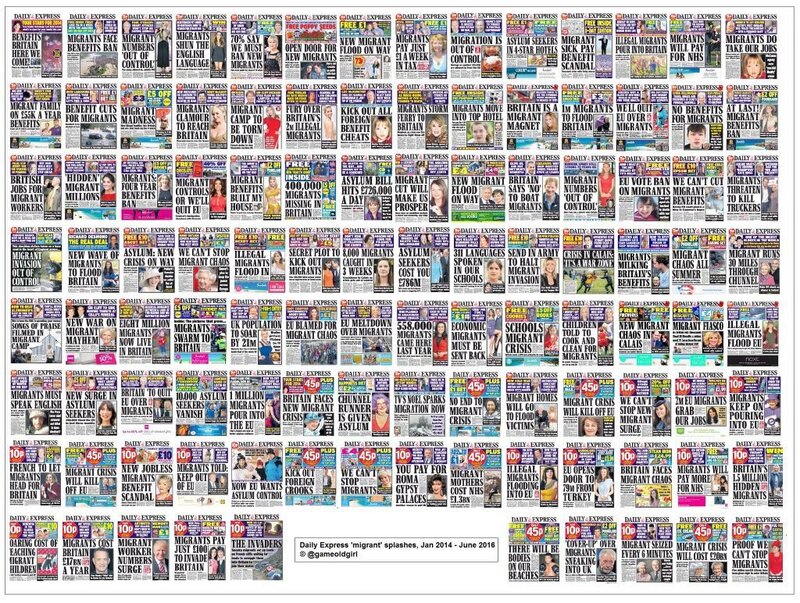 It's outrage and hate posed as balanced debate, and all for clicks and £££s. We are doing it to ourselves. ”This graph gives an idea of how regularly” and how often Islam related stories appeared on the front page. 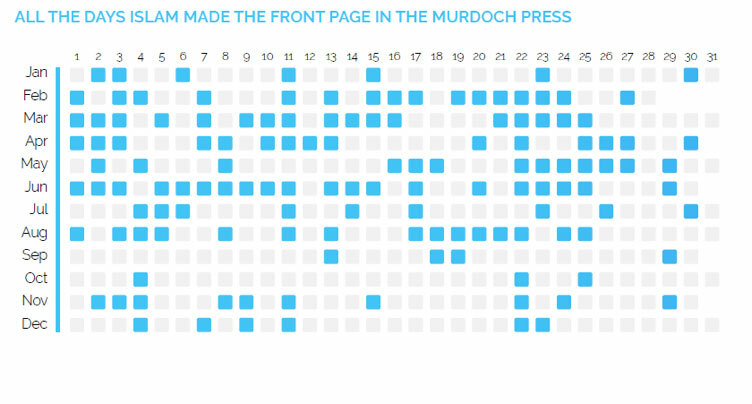 (Here for Murdoch papers Australia, no others included). But its government chose to ignore the warning. Although some in the New Zealand intelligence community heard what I and others were warning about, the issue was not given a high priority. The security agencies were much more preoccupied with investigating potential "jihadis", criminal gangs, or Maori "separatists". The result was that the extreme right was largely overlooked, as the intelligence community spent millions chasing other would-be terrorists, some real, some imaginary. “Wallahi, brother...I hope it never happen something like this in our life again...but in case anything happen, don’t stay quiet. Because you’re gonna die anyway. If you stay quiet or if you fight back, sometime you can win, and if you lose, it doesn’t matter. After seeing the heavily armed assailant, 32-year-old [Norwegian terrorist], kill several people at close range, Dzhamayev called his father, who urged the boys to fight back. So Daudov and Dzhamayev hurled rocks at [Norwegian terrorist], hoping to knock him unconscious. Q: What happened after you threw the stones at [Norwegian terrorist]? But after watching [Norwegian terrorist] kill an acquaintance by shooting him in the head, the boys fled. They turned their attention to finding a cave to help people hide as the rampage continued. In the end, they helped provide shelter for 23 people -- many of whom had entered the water surrounding the island, making them even more vulnerable. The True Martyrs shuhadá Will Live in Paradise! “The souls of martyrs are alive in the bodies of green birds who have their nests in chandeliers hanging from the Throne of the Almighty. They eat the fruits of Paradise from wherever they wish and they nestle among these chandeliers. For everyone interested in right-wing terrorism due to the events in Christchurch and in other countries, here is our recommended top 10 reading list to get up to speed. This kind of individualization of the terror event hides the true structure and background of white fascism & racism! 6: [link] 29 people were murdered outright and 125 wounded before the survivors managed to disarm Goldstein and kill him on the spot. Baroness Chakrabarti said: “I know there’s been a lot of controversy about a Newsnight piece that went out on Friday, the day of the massacre, where an extreme far-right voice was left essentially unchallenged. Nick Lowles, chief executive of anti-racism group Hope Not Hate, described the interview as “despicable” and called on the broadcaster to “apologise for the offence many people felt”. In the aftermath of New Zealand’s horrific terrorist attack, many people are searching for motives: how can a seemingly normal man be groomed into a anti-Muslim killing machine? 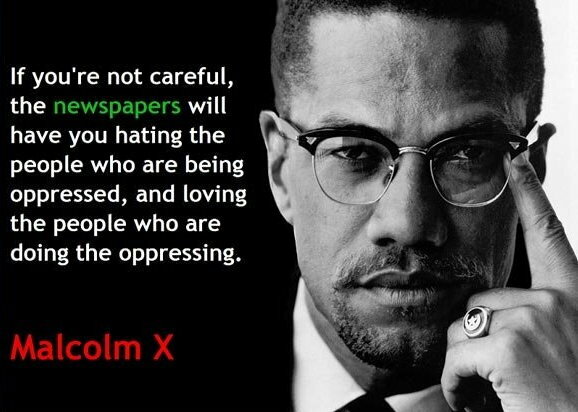 Last weekend [2019-03-16/17], a Muslim news producer said she quit Fox's corporate cousin, Sky News Australia, over its coverage of Muslims following the massacre at two New Zealand mosques. Her post went viral. Now, add the voice of one of Murdoch's former senior executives, who says he left his job in late 2017 over the coverage of Muslims, immigrants and race by Fox News and other Murdoch news outlets. In 2012 Vinzelberg posted on Facebook, underneath a picture of a boat full of asylum seekers, "Sink the f****n thing"
Today he's been been arrested for possessing unlicensed weapons after posting in support of the Christchurch massacre.